I just start to collect silver spoons and find one today in the local market in Netherlands. anyone can help me wit the marks? 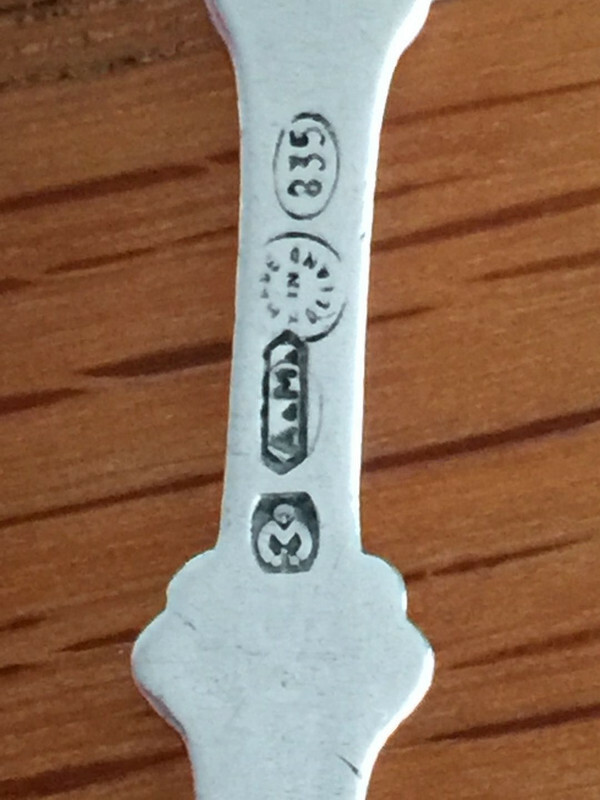 This spoon never has seen an official assay office, the silver standard or fineness is indicated by the oval mark 835 or 835/100 silver fineness or 83.5% pure silver. Made for export. Could you show us an image of the complete spoon? oel wrote: This spoon never has seen an official assay office, the silver standard or fineness is indicated by the oval mark 835 or 835/100 silver fineness or 83.5% pure silver.Peter. Source: L. B. Gans Goud-en Zilvermerken van Voet. Thank you for the information, very precise and helpful. 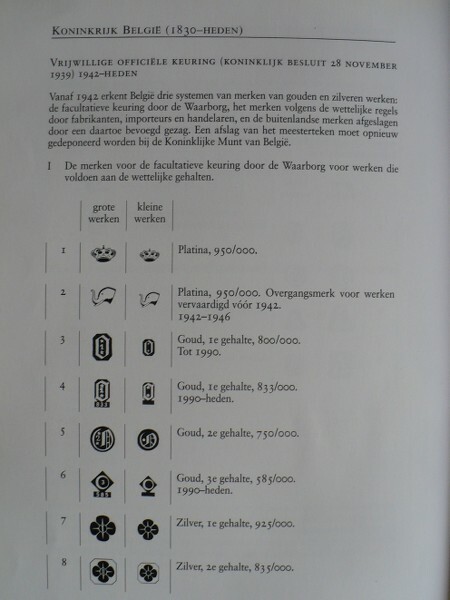 “General index of Belgian goldsmiths, silversmiths and Hallmarks” III - 1942 – 1997. He do’nt use the official mark of the fineness mark, who gives the degree (A) of fineness or purity of the precious metal. Some explanation why I was surprised by it. In France / Belgium, retailers are not allowed to use a lozenge shaped / a barrel shaped, that is only reserved for a silversmith. Instead, the retailers use a square or something else. The spoon, made in Holland, with Dutch maker's mark has no Dutch hallmarks. To be sold in Belgium, in order to comply with the Belgian law, a registered Belgian responsibility mark (retailers mark) and unofficial fineness mark must me applied. According to my source in accordance with the Order in Court of November 28th 1939, effective on January 1st 1942, voluntary hallmarking remains in existence, but makers may no longer use precious metal contents below 500/1000. The standard of fineness of precious metal objects must henceforth be guaranteed. Either by the makers, importers and retailers using their personal responsibility mark a mark registered bij the Royal Belgian Mint, or by a mark of the only remaining assay office in the Royal Brussels Mint, or by foreign hallmarks. Registered responsibility mark of maker, importer and retailer are in a barrel shaped shield. Source Goud en Zilverwerken van Voet Koninkrijk Belgie page 205 and Netherlands' Responsibility marks Part I, page 88. Could you reveal your source? Registered responsibility mark or maker, importer and retailer are in a barrel shaped shield. In the book of the Waarborgfonfs and WalterDievoet, only silversmiths are mentioned in all their legal title. Could you reveal your source from the book by Voet? 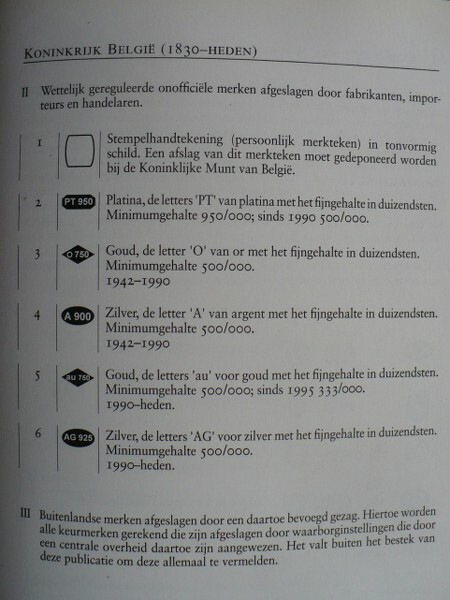 From 1942, Belgium recognizes three systems of guarantee of gold and silver work (standards); the optional assay marking by the (Belgian) Assay office, marking according to the legal rules by manufacturers, importers and traders, and the foreign marks applied by a competent authority. A punch-mark of the maker's mark has to be deposited again at the Royal Mint of Belgium. ɪ The marks for the optional guarantee by the Assay office for works that meet the legal standards. NB. In the list only a barrel shaped shield is shown being a personal mark/responsibility mark. A somewhat late reaction, since I now have a virus infection. There is much more to do with this, but think that this is sufficient. Hi Dendriet, first of all I wish you a speedy recovery and get well soon. It appears Voet is correct; registered responsibility mark of maker, importer and retailer are in a barrel shaped shield.